It's no secret that Gotham doesn't follow any particular storyline from the comics. The show is more or less a new take on classic characters that have been around for decades, so when they dropped the teaser for season 2 it shouldn't shock you that Barbara looks to be filling the Harley Quinn role this season. This is just a theory, but Barbara suffered a psychotic break at the end of the first season and it landed her in the asylum with Joker (as seen in the teaser). Joker senses her craziness and likes it. As we know from another teaser, Joker escapes to wreak havoc on Gotham and I would bet that the two end up coming together under a mutual goal. The goal would most likely revolve around hurting Jim Gordon and/or killing him. Now I don't think they will outright call her Harley Quinn, but I can see Joker making a offhand comment about Barbara being played for a "harlequin" by Jim. Like I said it's just a theory, but one that I could see playing out in this Batman universe. What do you think? Would the writers of Gotham go down this road or is Barbara just having a bump in the road? 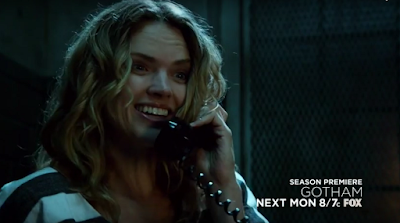 Gotham Season 2 will premiere on Fox on Monday, September 21.